Today the Euro hit a 12-year low against the dollar. 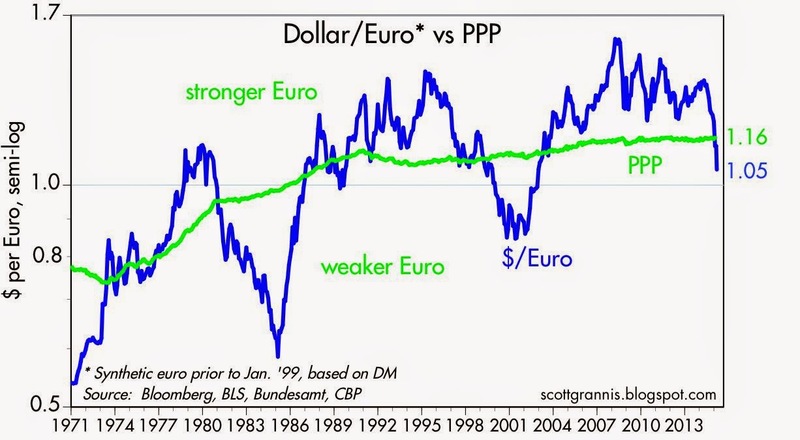 According to my calculation of the PPP value of the Euro, it is roughly 10% "undervalued" vis a vis the dollar. That means that Americans traveling to Europe should find that, on average, goods and services on the Continent are about 10% cheaper than they would be here. It's time to schedule that European vacation! Note that the chart shows that the Euro has been much weaker in the past, at times, than it is today. So there is nothing terribly unusual going on. I think the dollar's strength is a function of the fact that the U.S. economy seems more dynamic than the Eurozone economy. That naturally tips the balance of monetary policy towards higher rates in the U.S. than in the Eurozone. 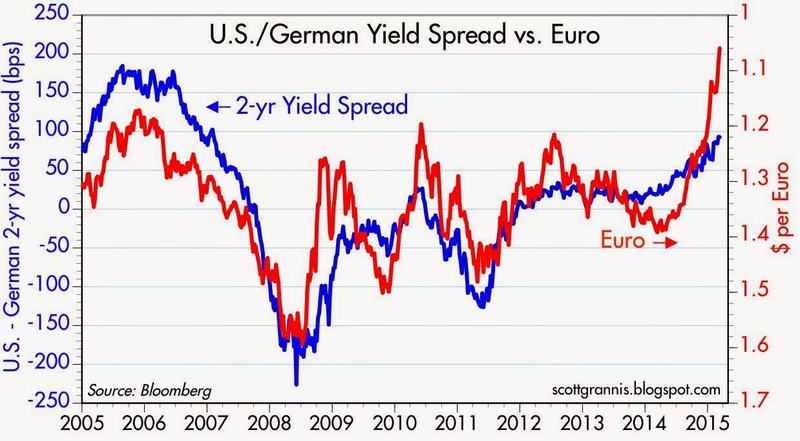 And as the chart above suggests, the interest rate differential does appear to be contributing to the Euro's weakness. The dollar is going up. The Dow Jones is going down. The Fed pondering rate hikes? Four months in a row the PPI is down.